It’s no secret that NASA’s Space Launch System is struggling to meet its schedule. The multi-billion-dollar launcher is expected to ferry humans and cargo into deep space. The problem is, the agency has vocally committed to sending an American craft to the moon next year. NASA’s new lunar taxi, called Orion, is almost ready to go. But its ride—the big and bloated SLS—is still years from completion. On Wednesday morning, NASA administrator Jim Bridenstine appeared before the US Senate Committee on Commerce, Science, and Transportation to discuss America’s leadership in space. During his testimony, he revealed an unexpected twist. For the first time, Bridenstine said that the agency would consider commercial rockets to get its crew capsule off the ground. For NASA, travel to deep space would no longer be SLS-or-bust. “We are now understanding better how difficult this project is,” he explained. Before the retirement of NASA’s storied space shuttle program, the agency began laying out its vision for its next-generation rocket. In 2011, development began on SLS, which it hoped would become the biggest rocket in the world. But year after year, as it missed its targets and blew through its budgets, the agency faced criticism for the project’s shortcomings. Dubbed the rocket to nowhere by its critics, SLS was at times derided as more of an agency-wide jobs program than a real ride to space. That is until 2017, when the rocket received a new goal: ferry astronauts to the moon. To meet those deadlines, the administrator acknowledged that all options—including commercial rockets—should be considered. Bridenstine’s comments were unexpected; for nearly a decade now NASA has supported an SLS-only approach to sending its astronauts into deep space. (The agency had originally limited its commercial partners to sending crews no farther than low-Earth orbit and back). But with an extremely tight timeline and multiple technical delays it’s now abundantly clear that SLS will almost certainly not be ready to fly in 2020. Over the years, Orion’s destination changed from Mars to the moon, and even to the surface of an asteroid. But one thing was certain: on Orion’s first foray beyond Earth, a crew-less capsule would complete a six-day circuit of the moon; that’s the mission Bridenstine now says could launch atop a commercial rocket. Dubbed Exploration Mission 1 (or EM-1), it had also been intended as SLS’s maiden voyage. The hitch is that Orion is too heavy for any commercial vehicle now in use to deposit it in lunar orbit. Bridenstine acknowledged this in his testimony: “The challenge is we don’t have a rocket right now that can launch system Orion and the European Service Module around the Moon.” (Built by the European Space Agency, the service module will provide power to Orion during flight). Instead, Bridenstine proposed that the mission could be done in phases. First, one rocket would send Orion and the European Service Module into orbit around Earth; a second rocket would launch system an upper stage separately. That upper-stage rocket would have to meet up with the duo in orbit and boost them to the Moon. But this, too, is easier said than done, as the docking technology required to pull it off doesn’t exist yet. But Bridenstine did not mention which rockets would carry out such a mission. Currently, only two vehicles can haul large amounts of cargo to space: SpaceX’s Falcon Heavy and United Launch System Alliance’s Delta IV Heavy. Switching to a commercial rocket for EM-1 would deliver a major blow to the SLS program, which has been criticized for is massive budget—an estimated $14 billion—and snail-speed development. But with the debut of the Falcon Heavy, its reason for being has become less and less clear. (A Falcon Heavy can deliver nearly 141,000 pounds to low-Earth orbit, while a Delta IV can carry 62,540 pounds and SLS a theoretical 209,000 pounds). The big takeaway: If NASA can send Orion to space on the backs of private rockets, it’s likely that future crewed missions, which were slated for SLS, can as well. (Bridenstine told Congress that the agency will be looking into the commercial possibility as soon as possible). In a speech on Monday, the administrator explained that other elements of the planned Lunar Gateway—which is essentially a mini space station orbiting the moon—may also launch system on commercial rockets. But this isn’t the only blow to SLS this week. On Monday, the president released his budget request for 2020. In it, Trump proposed cuts that would shrink NASA’s overall budget by two percent, or $21 billion. 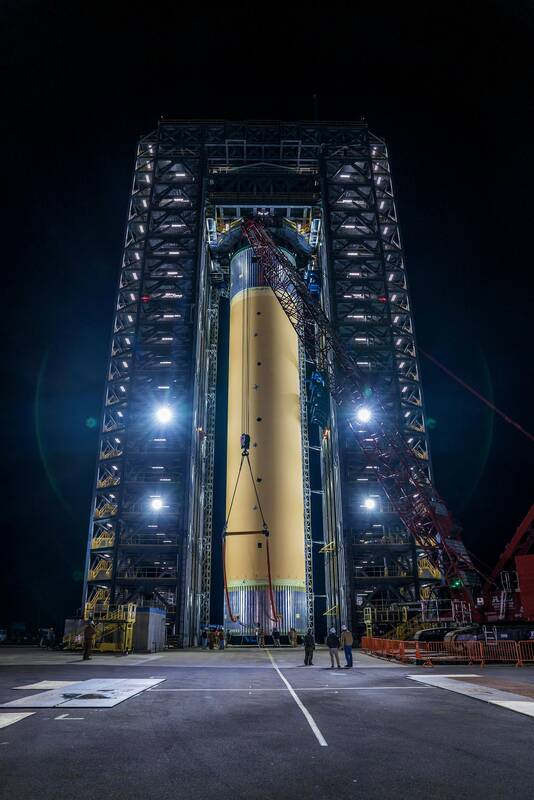 The cuts include halting development on a second, more powerful version of SLS; a request that strips the rocket of its biggest asset: lift capacity.